West Chester, OH; September 2018—In a ceremony immediately preceding PRINT 18 in Chicago, the Color-Logic Touch7 Neon Suite was designed a RED HOT Technology. More importantly, the Touch7 Neon Suite received the coveted Vanguard Breakthrough Award, presented only to products considered 'game changers.' The Touch7 Neon Suite is one of only five entries to gain the recognition, and is one of only nine recognized products in the entire Vanguard program. Commenting on the award, Richard Ainge--Color-Logic CTO and the inventor of the Touch7 Neon Suite--observed: "In selecting Touch7, PRINT 18 management recognized the importance and timeliness of neon inks at the show. With Touch7, graphic designers can easily and confidently produce files to take advantage of the fluorescent inks just now entering the market." The Touch7 Neon Suite is a collection of Adobe Photoshop plugins, palettes, and software for digital and analog print engines. Touch7 enables users to design and print within the maximum gamut of the print device being used. 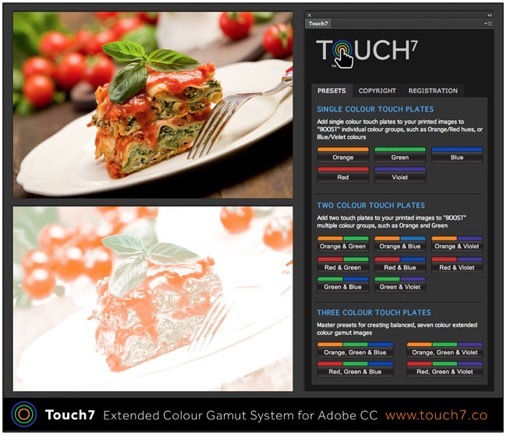 Using Touch7, graphic designers can take full and complete advantage of the new expanded color gamut and fluorescent inks. In recent years, ink companies, print engine manufacturers, RIP developers, and ICC profiling tool producers have developed many new means of printing, but until Touch7, no one focused on providing creative tools for designers. With Touch7, the ability to use expanded color gamut printing is now available to even the smallest print shop. At PRINT 18, Color-Logic will exhibit the Touch7 design tools in booth 4133. West Chester, Ohio, USA; September 2018--HP Indigo and Color-Logic will join forces at PRINT 18 in Chicago to demonstrate how HP Indigo white ink, expanded color gamut inks, and fluorescent inks let graphic designers offer brands and product managers an unlimited array of special decorative effects and colors. Discussing the collaboration, Color-Logic Director of Sales and Marketing Mark Geeves said: "The latest HP Indigo product enhancements-to be shown at PRINT 18 in Chicago-enable graphic designers using the Color-Logic Process Metallic System to differentiate their products in all forms of print media." Richard Ainge-Color-Logic Chief Technology Officer and the developer of Touch7-commenting on the PRINT 18 offerings, said: "Time-to-market is critical today and embellishments require longer at the design and concept stage than ever before. At Color-Logic, we have worked with HP Indigo DFE developers to ensure that Color-Logic files are processed precisely and as intended by the graphic designer. Designers utilizing the Color-Logic and Touch7 systems at our licensed printers can choose metallic colors from a swatch book and rest assured the press will produce their files exactly. Our design tools for Adobe CC and CS enable designers to create dramatic decorative effects in just seconds, while eliminating the guesswork and trial-and-error typical of metallic file preparation." Color-Logic will exhibit in booth 4133. HP Indigo will exhibit in booth 2411. Amazing Color-Logic and Touch7 samples will be available in both booths. Touch7™ is powered by Khaos Technology™, a developer of Adobe plug-ins and software tools for the printing industry. For more information, visit www.touch7.co or call +1-513-258-0047. 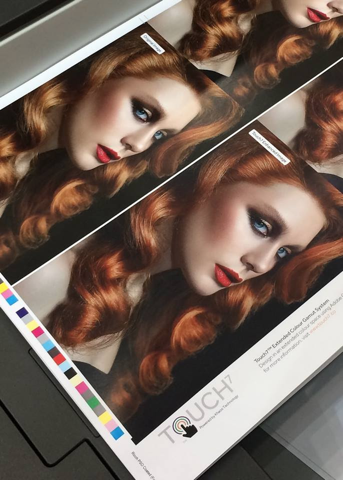 West Chester, Ohio, USA; April 2016—Touch7 Photo is a new product for extended color gamut printing, that has nothing to do with metallics, but everything to do with color – Let us explain what Touch7 Photo is and what it provides to you and your clients. The developments by ink companies, print engines, RIP manufacturers and ICC profiling tools has been extensive over the past years, however, no one has really focused on the necessity for providing creative tools for designers, so that they can utilize these developments and reduce their cycle time to production. Touch7 was developed as an intuitive system that would help brands utilize ECG printing at a fraction of the time and cost associated with doing manual processing, and without the necessity to send your files through a dedicated colour separation system, therefore opening up ECG printing to even the smallest print shop. The true power of Touch7 lies in it’s automated ECG colour palettes and plug-ins for Adobe CC, ensuring that designers can create artworks in an extended colour gamut, without ever having to leave the familiar creative environment. Touch7 Photo is a Photoshop plug-in that uses proprietary separation technology to automatically extract out ECG colors from your images, and all at the touch of a button! Automatic ECG separation – Extract out only ECG gamut areas from an image. No more masking – Unless you want to! Skin tones and colors that are easily achievable out of CMYK, are not effected by ECG inks. Save hours on image processing times compared to a manual masking with simple "One Click" buttons, convert your photographic images in seconds. Excellent ROI – The time saving on image masking alone, will pay for itself within a few images! Touch7 is licensed on an annual subscription basis. Single Seat Installs. Downloaded the Touch7 Photo Plug-in from www.touch7.co/demo, to begin your FREE 7 day trial. You will also have access to several files that have already been processed with and without Touch7 Photo, for a quick evaluation of what you could be doing off your press or printer.